Most of you probably have a Turbo Charger or two laying around your house, thanks to a handful of decent deals on them over the past year. But do any of you have a fast charger for your car? 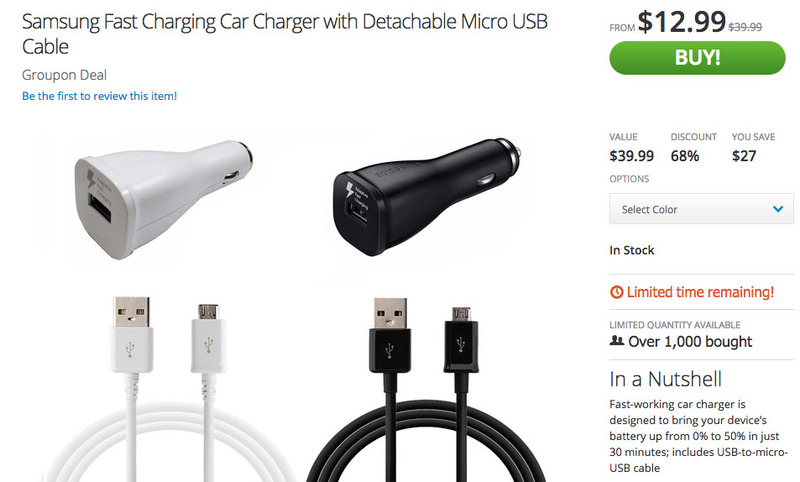 If not, you can pick-up a brand new, Samsung Fast Charging Car Charger for just $12.99 over at Groupon (USB cable included). Groupon is claiming that you are receiving some massive 68% discount, but that’s kind of a lie. These chargers can be had at Amazon from around $15 with a USB cable. Still, saving a couple of bucks on an already-cheap fast charger for your car isn’t something to complain about. Like with the fast wall chargers, you can grab up to 50% charge in just 30 minutes time.